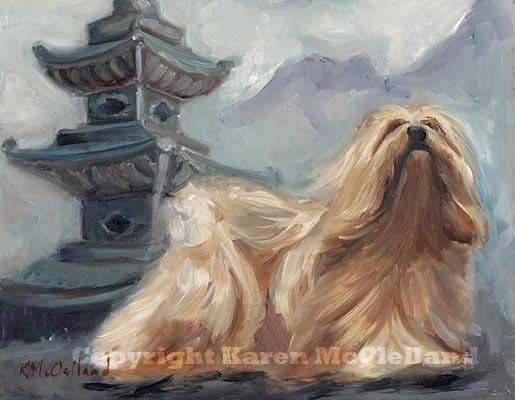 Lhasa Apso Dog limited edition giclee art print, dog painting done by artist Karen McClelland titled "Mystic Lhasa"
Lhasa Apso Dog print titled "Mystic Lhasa"
One of the paintings done as a trophy (three are currently available as giclee reproductions) for the 2008 Lhasa Apso national specialty. In several of the paintings I tried to show some of the cultural origins of the breed. And of course the long beautiful coat was just made for movement with the breeze. Contact information received on entry forms is not shared with any other parties. Dog paintings by Karen McClelland © 2001-2009, All rights reserved Copyright shall at all times remain vested in the Artist. No part of the work shall be used, reproduced, stored in a retrieval system, or transmitted in any form or by any means electronic, mechanical, photocopying, recording or otherwise, without the Artist's express written consent.